Summertime in the UK means berry time, and there’s just nothing like the taste of fresh, seasonal, locally sourced fruit that has gone from farm to fork (or in this case blender) in just a matter of days. You can really taste the freshness and the flavour, which is why (along with the environmental reasons of course) we are so for buying seasonal produce. Berries (and blueberries in particular) are high in antioxidants, as well as being low GI, so they’re great if you’re trying to cut down on sugar, and they won’t cause a spike in your blood sugar levels. The antioxidants in berries are fabulous for your health, as well as being great for your skin and your hair too. They also have lots of vitamin C, as well as heaps of fibre, so they’re great for your digestive system too! It’s no wonder that berries are considered superfoods! 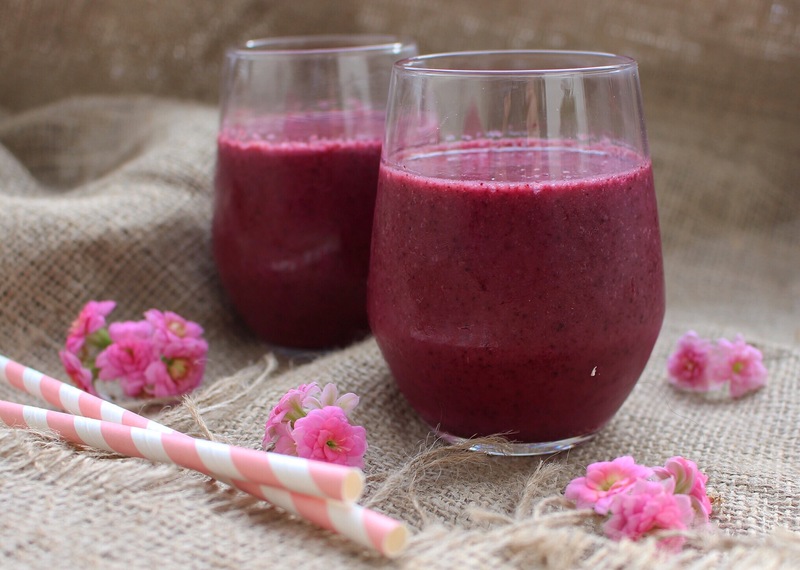 This smoothie is something we can’t stop drinking at the moment – it’s refreshing, sweet and creamy, and our skin is definitely thanking us for it too! It’s a win-win! Simply combine all the ingredients in a blender until they are all lovely and smooth. Pour into a glass – bottoms up!